The golfing world has lost a giant with the death of Arnold Palmer. Palmer passed away at the UPMC Presbyterian Hospital in Pittsburgh, Pennsylvania, where he was undergoing heart tests. The 87 year old is widely regarded as one the sport’s greatest ever players and won over 90 tournaments worldwide including 7 majors. Born in Latrobe Pennsylvania in 1929 Palmer turned professional in 1954 and retired in 2006 following a glittering career that also included 7 Ryder Cup wins. Some of the worlds top players including Jason Day, Zach Johnson and Rory McIlroy lead poignant tributes to Palmer within the golfing community with Johnson tweeting “My heart aches with passing of the King. What he did for golf cannot be measured. 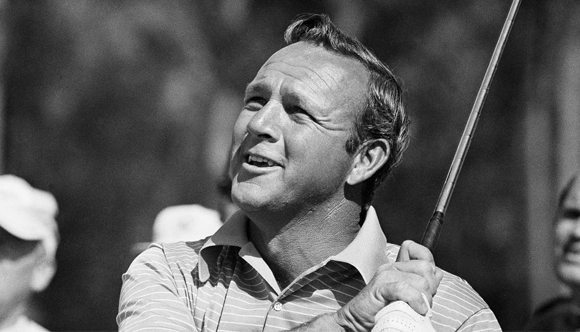 Athlete, pioneer, philanthropist, family man, and much more…RIP Arnie,” Outside of the sport some of the biggest personalities in the world including US President Barack Obama and football legend Pele also paid tribute to and shared their memories of Arine. Arnold Palmer has a close affinity to the South West Ireland as he designed Tralee Golf Club in its current layout which opened in October 1984. Mr. Palmer is survived by his second wife Kit, his two daughters, six grandchildren and numerous great-grandchildren.